This week, the Prime Minister’s Prizes for Science were awarded to recognise the contributions our scientists, innovators and science teachers make to Australia’s scientific and commercialisation capabilities. 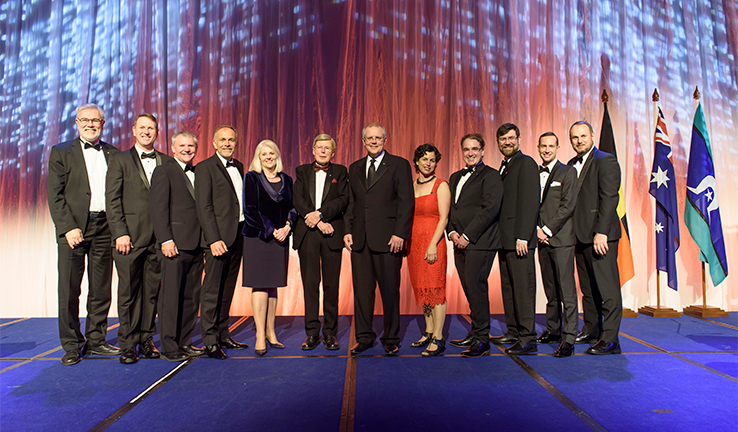 We congratulate the winners and all the nominees for their contributions to science in Australia. 2018 Prime Minister’s Prizes for Science winners. (L-R) Dr Simon Poole, Dr Glenn Baxter, Mr Andrew Bartos, Dr Steven Frisken, Minister Karen Andrews, Emeritus Professor Kurt Lambeck, Prime Minister Scott Morrison, Dr Lee Berger, Associate Professor Jack Clegg, Mr Brett Crawford, Dr Geoff Rogers, Dr Scott Sleap. More information on the winners, including videos of their achievements can be found here. Nominations for the Prime Minister’s Prizes for Science for 2019 will open in early 2019. Follow @sciencegovau on Twitter or subscribe to the National Innovation and Science Agenda newsletter at http://bit.ly/2ydPxcl to receive notification when nominations open.